This two-piece set proves whiskey really can do anything. Imagine a world in which whiskey does more than just raise your spirits—it softens your beard. This two-piece set lets you live that fantasy, and its cheeky name—Get it? Whiskey business?—clues you in to the fun in store. Made from soy wax and housed in a recycled glass jar, the candle fills your home with the complex spicy-sweet aroma of your favorite booze. Meanwhile, a drop of small-batch beard oil conditions your whiskers and keeps skin happy, too. We'll drink to that... won't you? 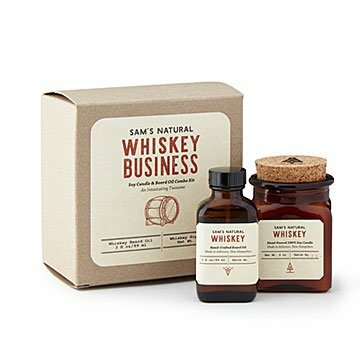 A great gift for any hirsute whiskey lover. Handmade in New Hampshire. Candle: 8 oz; Beard Oil: 3 fl oz; Box: 6" x 4" x 6"
Candle: Keep away from things that catch fire. Never burn unattended. Keep out of reach of children and pets. Burn on heat resistant surface away from heat sources. Trim wick to 1/4" before each use. Do not cover candle with cork top while lit or warm. Do not burn when only 1/2" or less of wax remains. For optimum results, burn candle 4 hours minimum each use for even pooling.